This was meant to be published in early October but my internet connection wasn’t good enough for upload photos, so here it is now. Oh the frustrations of finding dwarf mongoose in the bush. To start off, they are pretty small – less than 30cm in length! Add to this, that they are a lovely brown colour that happens to blend in quite well with wood and the ground. In addition, they can be very quiet. I’ve been with a group before and they have gone silent, leading me to believe that they have moved but actually they’re just being quiet. So when you’re looking for them, that’s no help. It’s easiest to look for them in the morning and just before sunset, as they will either at or near their sleeping refuges. At these times of day, it is a case of making the rounds within their territory and hoping you catch them before they leave (in the morning) or go to sleep (in the evening). This usually works, but occasionally the group will be using a refuge that we don’t know of, so the theory falls down there. 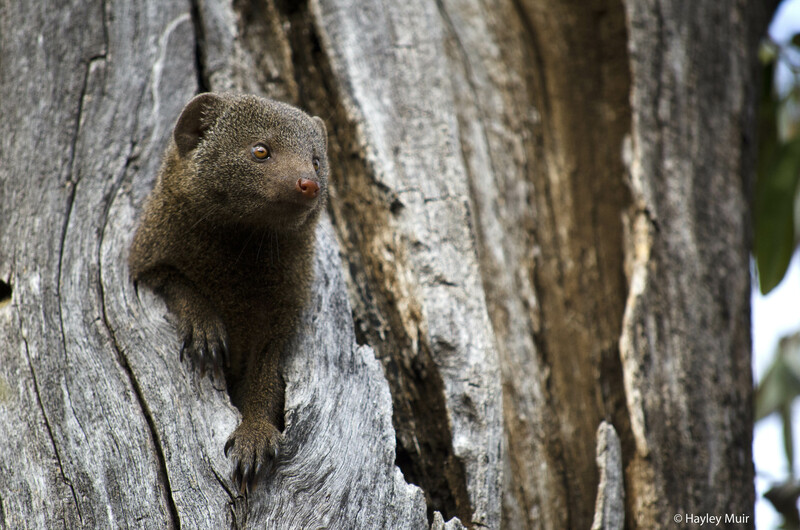 A mongoose up in a tree! During the day, it gets a bit more difficult as you have got to walk throughout their territory calling for them. Yes, we call out to them and we actually call “Mongoose”! 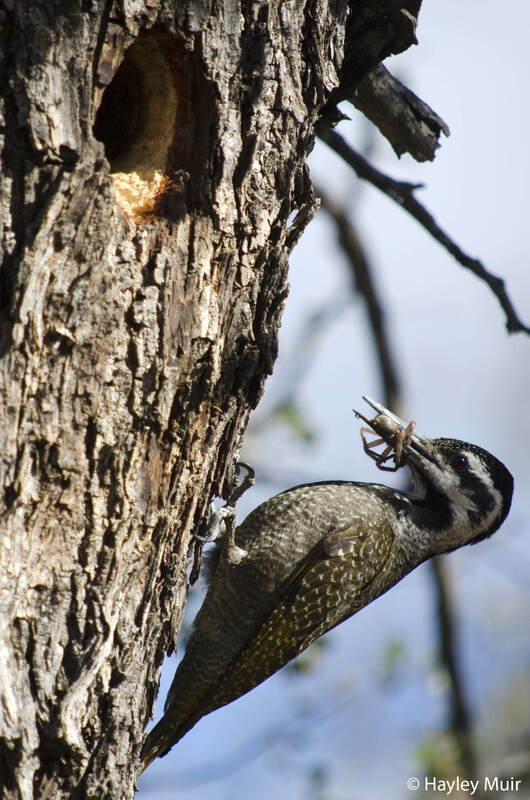 It sounds a little bizarre, but they’re habituated to come to that call and receive a little bit of food for it. Some groups are great, they’ll respond to your call with enthusiasm. I have had one group come running to me from almost 50 metres away. On the other hand, I have been right next to a group and been completely ignored by them. 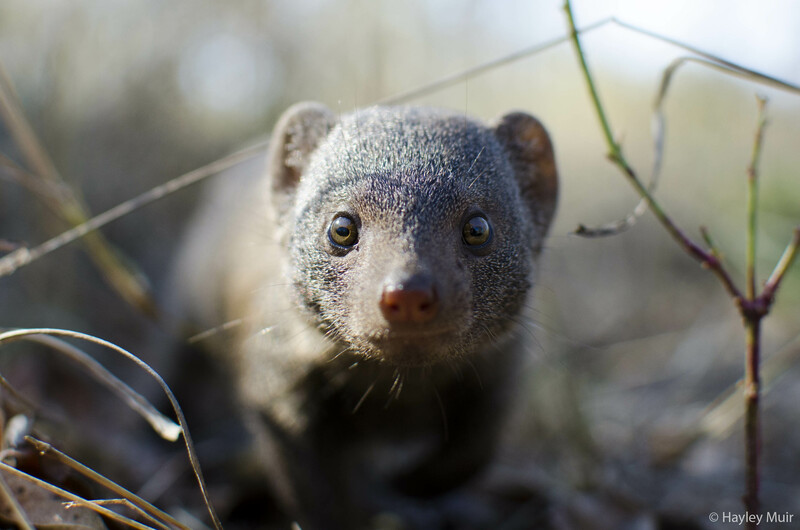 So you still have to rely on your eyes and ears for any tell-tale signs of mongoose presence. The slightest rustling can get me suddenly veering off my path and calling hopefully for mongoose. I say hopefully because it is usually a couple of birds that I’m scaring off. They do make small contact calls to each other, but you usually can’t hear them unless you are fairly close. As for seeing them? Almost no chance unless they’re moving between foraging spots or in an obvious sentinel position. 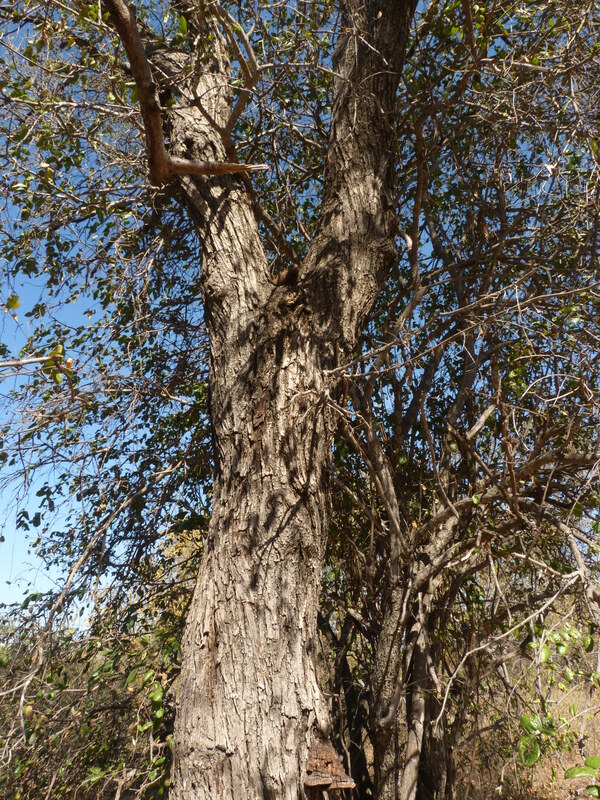 Take these photos below, can you spot the mongoose? To myself, the mongoose in the first photo is very obvious, and in the second photo, still quite noticeable. 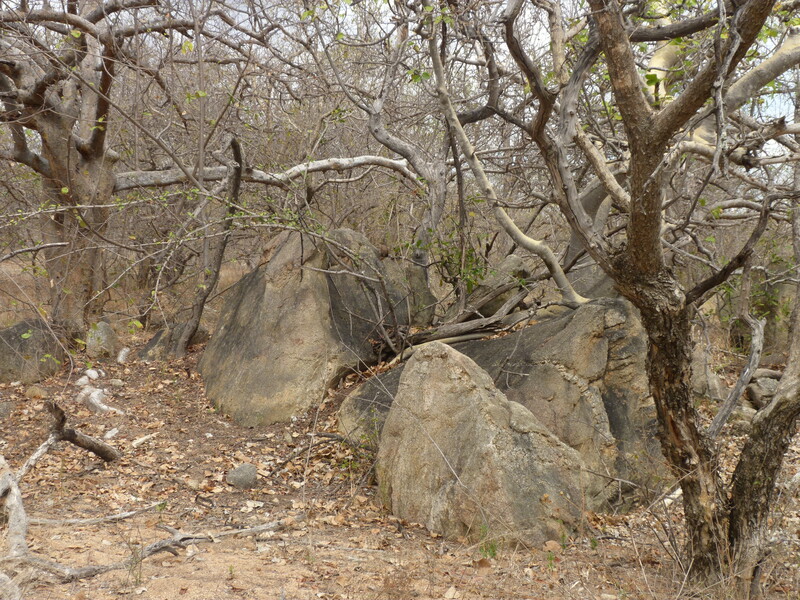 But usually, they’re hidden amongst the rocks or branches and it’s a bit more of a challenge. http://builddomain.co.uk/wp-content/uploads/2016/11/weblogo.png 0 0 admin http://builddomain.co.uk/wp-content/uploads/2016/11/weblogo.png admin2013-10-24 11:13:532013-10-24 11:13:53Wherefore art thou mongoose? 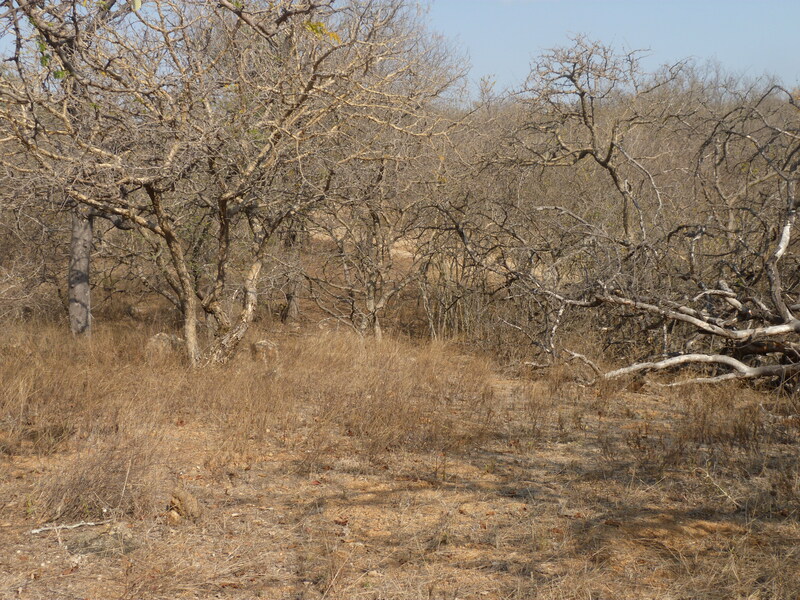 Due to the recent increases in temperature, the middle of day is now quite hot and as a result, the mongoose flake out in the shade for a few hours and we head back to the house. 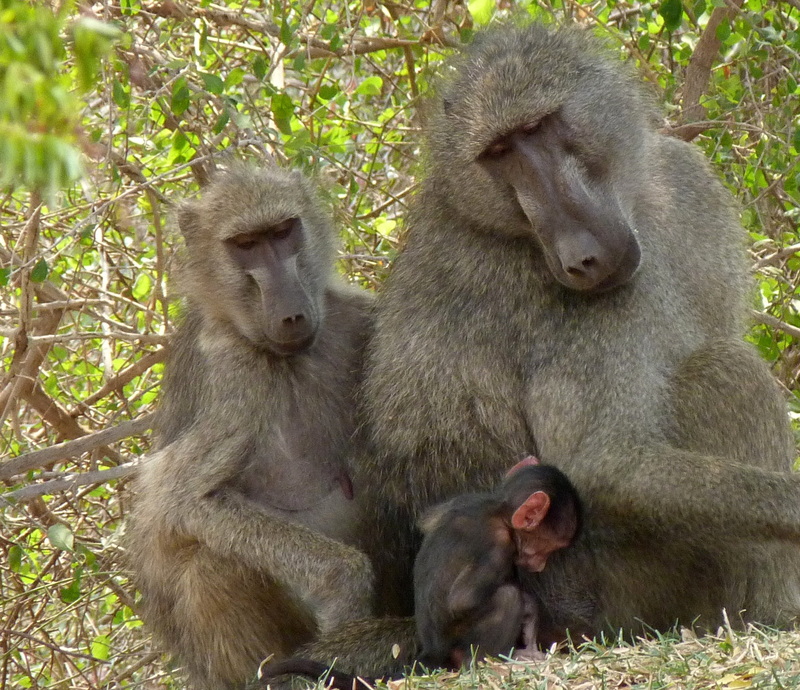 During one of these midday breaks, I got a good view of the local troop of baboons as they cavorted on our back lawn. One of the larger males even came and sat himself on the stoep (patio-type area), no more than 5m from me – although I was inside and hiding behind my curtain. When I moved and took a photo he freaked out and ran off. Not long after, I heard a noise from the other side of the house and moving to investigate, I found another part of the troop, including the cutest little youngster who was exploring various things by chewing them – twigs, grass, even his own foot at one point! A number of reptiles are present both in and around the house. Before I came out here, there were apparently some baby Mozambique Spitting Cobras in the grass outside my bedroom. Nyala and Kudu both have skinks in their room, whilst Kudu also found a tiny gecko. 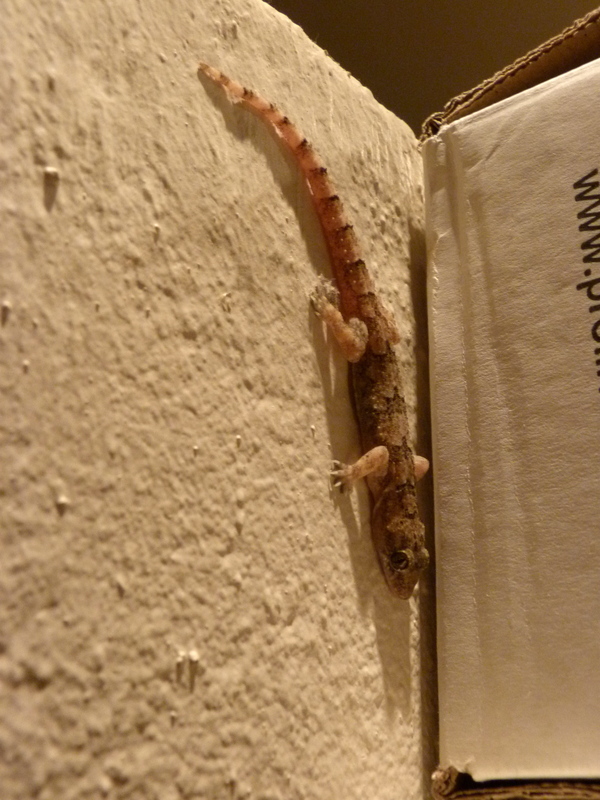 We recently found another gecko in the kitchen, which moved into my room a few hours later. Despite flicking through a reptiles book, we couldn’t identify it. If you know what it might be, we would be very interested to find out! 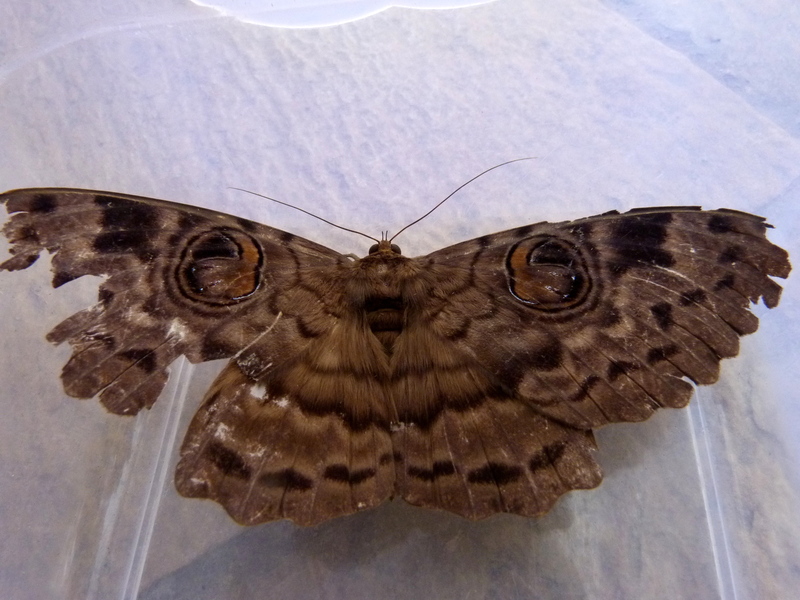 Talking of things I’m interested in, I found a pretty awesome moth the other day. A Walker’s Owl Moth which can have a wingspan of 12cm! I put it in a box and into the fridge to reduce its activity (standard practice for restless moths), which the others were somewhat bemused by. But it worked, as I managed to get a decent photo of it for identification. 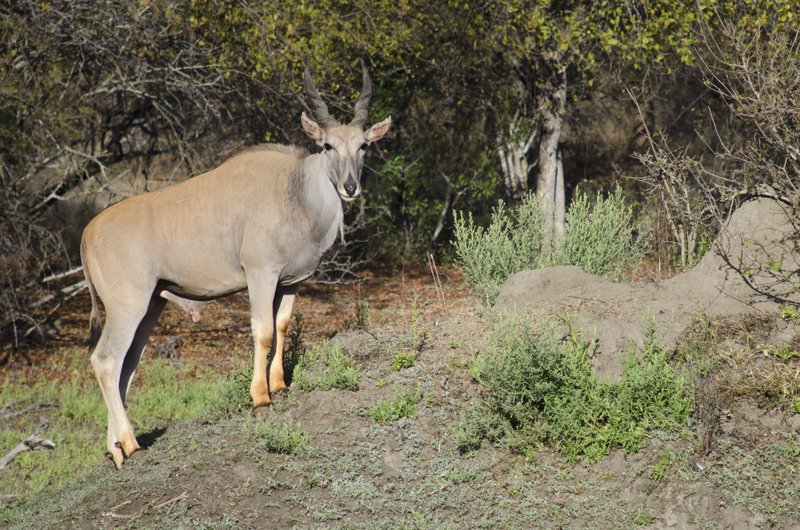 We’ve seen kudu and bushbuck down at the riverbank, vervet monkeys scrambling around the trees and across the lawn, and waterbuck grazing on the lawn. Hippo have also been heard on the lawn at night (slightly unnerving when you’re just dropping off to sleep). So even being at home can be exciting for wildlife … and it helps when that home is in South Africa! Unlike most of the previous blog-worthy sightings, this week’s ones occurred at our workplace. On a side note, I like using the word ‘workplace’. 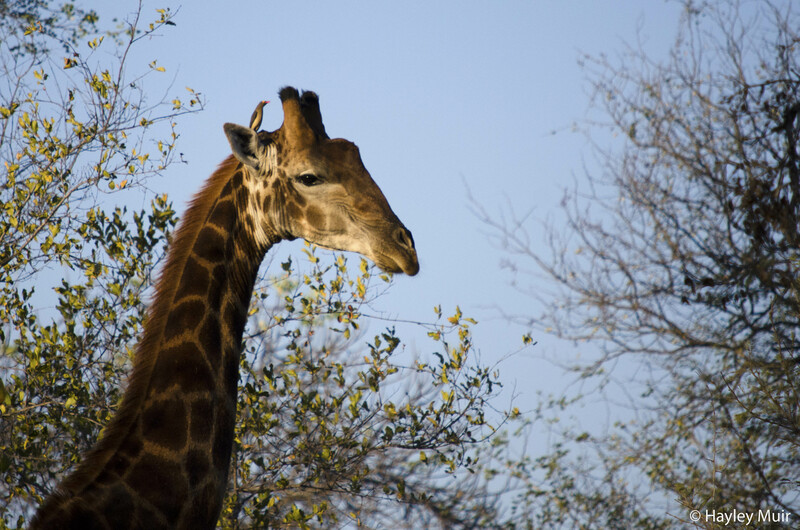 For many, it will evoke an image of an office or another indoor environment, which reminds me of the fact that – yup, I’m in South Africa, out in the bush, in lovely weather (usually) and seeing a variety of exciting animals. Anyway, enough gloating and back to the topic of the post … exciting animals this week! Recently I’ve been spending a lot of time with our newest habituated group, getting sound recordings as they forage or go on sentinel (looking out for predators on behalf of the whole group). At one point, they had taken me into a new part of their territory (we didn’t even know that it was part of theirs!) and were latrine-ing at a rock. As I watched, I noticed something odd. They were also taking turns to investigate something under the rock, scrabbling away at the gap at the base of it. When I got slightly closer, I could hear a noise that sound like deep breathing. It reminded me of Darth Vadar, but I soon realised that it must be a puff adder. Apparently, mongoose will mob snakes whenever they can, to encourage the snake to move on. I have to admit, I felt quite sorry for the snake. There it was, just having a nice sleep under a rock, then it gets disturbed and harassed by this group for over ten minutes! Poor thing. 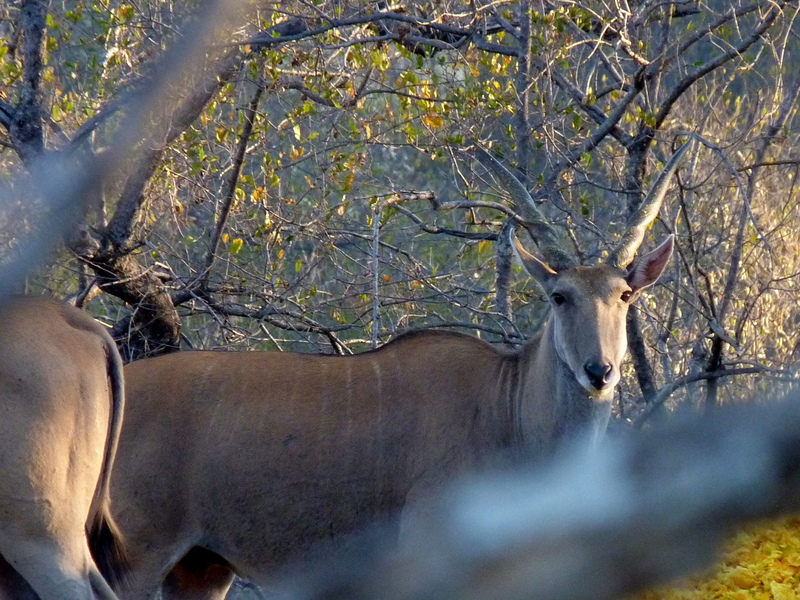 The main big sighting of the week was Nyala’s (like I said previously, I’m using code names for the others here). As she was weighing the mongoose group she was with, they started alarming at something. A common practice for them, and usually at something very uninteresting – they’ve been known to alarm at hornbills, who they co-forage with, so I don’t always trust their alarm calls. Naturally, we take a look around anyway, because you never know what they’ve seen. And this time, it was a pretty awesome animal – a leopard! About 40ft from where she was sitting and sniffing a tree. The sighting lasted about a minute though as the leopard realised she was there, growled and ran off into the bush. Naturally, the rest of us are completely jealous, I would love to see a leopard! 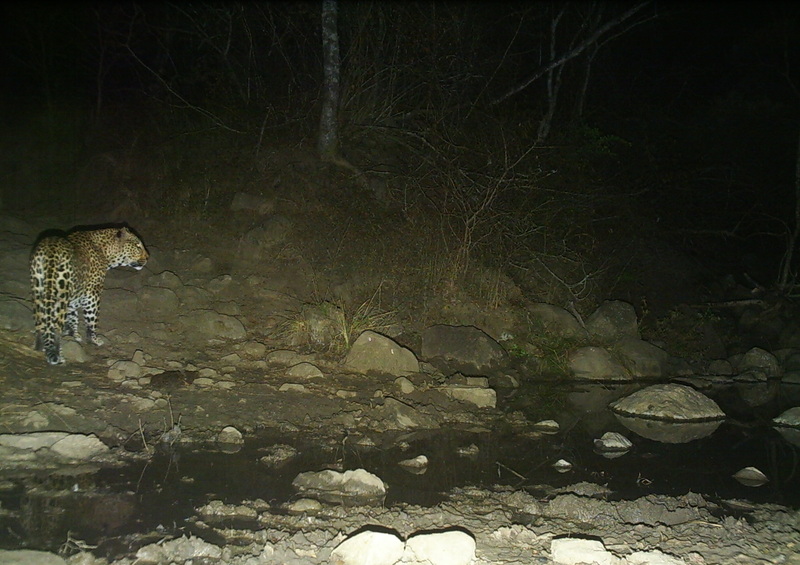 The closest I’ve come previously has been setting out camera traps when I was last in South Africa at UmPhafa Private Nature Reserve, and the leopard was only caught on camera just over a month after I left! Oh, and I’ve seen paw tracks. It doesn’t quite compare to a live sighting though, I shall keep my fingers crossed and my eyes peeled just in case. Kudu also had a very enviable feline sighting, a serval who leapt into the middle of the foraging mongooses (leaping quite a reasonable distance, the arm movements used to describe this distance backed up the words), causing them to scatter in all directions and remain lost from each other for the next few hours. Other sightings have also occurred this week, though slightly less exciting they still inspire delight. I’ve spotted a Giant Plated Lizard, whom I have nicknamed Grumpy Face (go take a look at what they look like, and I’m sure you’ll agree! ), a duiker who came quite close to me whilst I sat at a refuge (before realising I was there, then running 10m in the opposite direction, stopping to check if I was still there, then freaking out and running away again), and a new type of butterfly and dragonfly. Unfortunately I can’t easily identify the species of the latter two as the insect book I’ve been using was on loan from a friend. The problem with great sightings is that they seem to occur when your camera is in your bag and they’re over before you can get it out. Hence the lack of photos in this post! NB: My previous visit to South Africa was in 2011 to UmPhafa Private Nature Reserve (http://www.umphafa.com/) when I volunteered for two months and collected data on plains zebras for my undergraduate dissertation. The work of a dwarf mongoose research assistant does not vary all that much and can be summed up in one word: habituation. A few more details would include GPS tracking, weighing, sound recordings and behavioural observations. However, there are often times when you can’t do these because sometimes the mongoose do nothing (yes that could be a behavioural observation, but it’s not the type we’re specifically on the lookout for). Maybe the mongoose are having a lie-in, or even not moving from the refuge all day (very lazy but it does happen occasionally). What’s a research assistant to do then? Staring into space isn’t really an option – it gets boring very quickly and your brain turns to mush. Personally, I am in love with my Kindle. Before I used one, I was a solid believer in proper books. I love browsing the shelves for a new title, the different smells they have, how they look on my bookshelf (well not my current bookshelves because they’re absolutely jampacked in there and it’s a mess, but anyway), and the weight of a book in my hands. Yes, I will admit right here and now, I am a confirmed bookworm. However, when travelling and doing fieldwork, a Kindle is the choice for me. I won’t lie, I am a pretty fast reader so lugging all the books I would read during my time out here would not feasible. I’ve been here 3 months and I’m not far off the 100 books mark. Plus, it can also hold PDFs so I even read journal articles and theses. My other time filler is writing in a journal. I mentioned this to a friend of mine and he replied “What, a real handwritten journal?” Yes, a real handwritten one (kind of difficult to do an electronic one!). I think it will be nice to read back in the future and have this written reminder of the day-to-day moments that might otherwise blur into a general memory. Until I finished the book, I used to do SuDoku puzzles in the morning to wake myself – even timing myself to see if I improved (I did). My replacement for this is to practice French plaiting my hair, something I’ve always had difficulty with but I think my skill in this is improving. 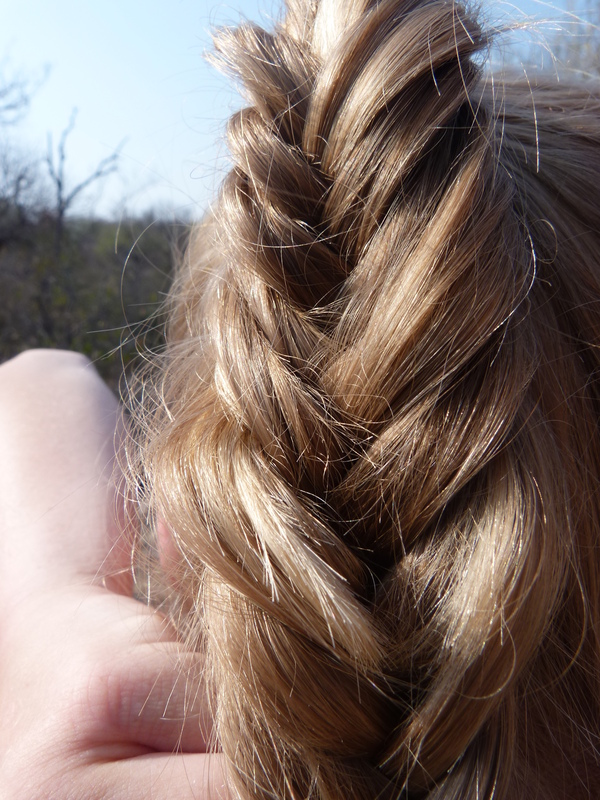 French plaiting my ponytail, not bad for only my second attempt! So there you go, an insight into the life of a dwarf mongoose research assistant. Fascinating stuff I’m sure. 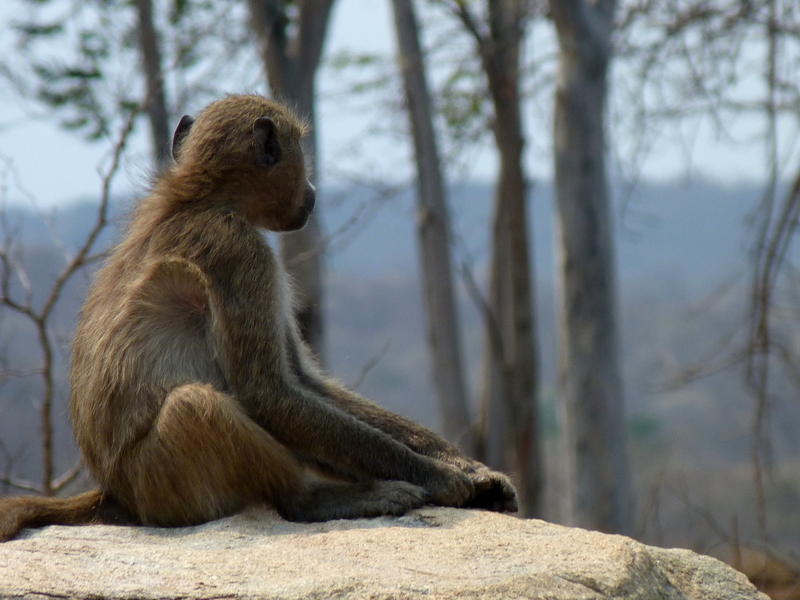 Recently the other researchers and I took another busman’s holiday, being taken on a game drive on the nearby Karongwe reserve with a researcher there. 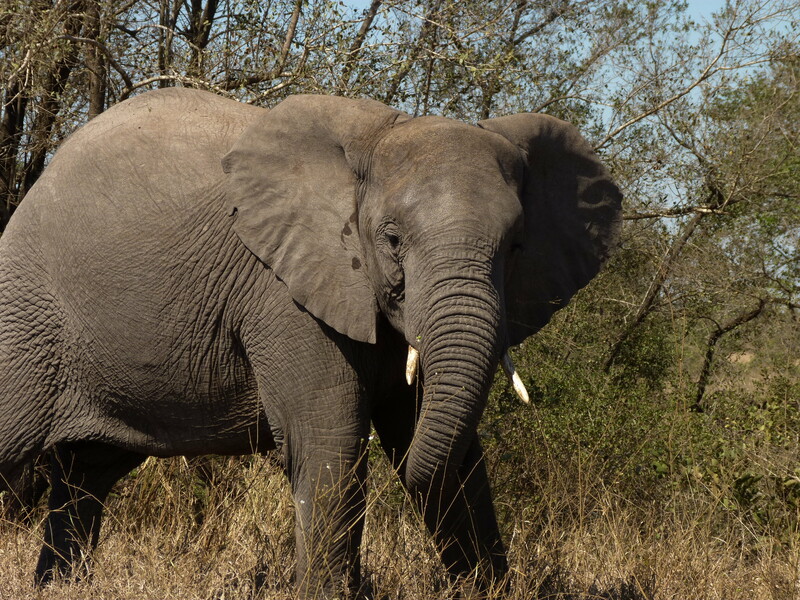 We are a bit used to the normal game drive animals, and luckily the researcher was looking for particular animals for the daily data collection. The first was a cheetah, exciting enough by herself but add in her four cubs and we were buzzing with anticipation. We were not let down. The adult is habituated to humans walking near her so we managed to get roughly 10-15m away from her and the cubs, who were absolutely adorable! Climbing trees, climbing mum, licking mum, being licked by mum, scrambling on a termite mound … they were spectacular. 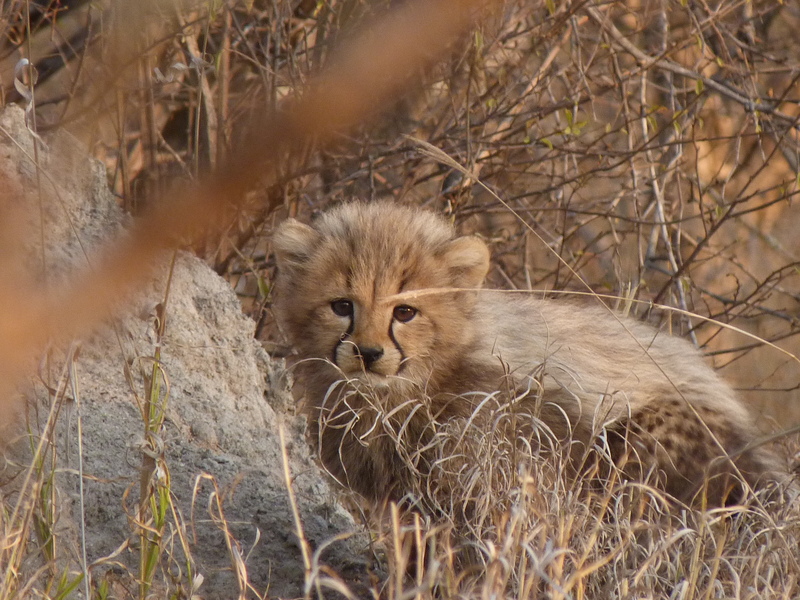 We all agreed that there isn’t much cuter than a cheetah cub – so fluffy! Not long after we tracked down the male lion, who was sound asleep. I think that maybe he twitched his ears when we approached in the vehicle. We were told that he had been eating a zebra kill for the last couple of days. We couldn’t see the zebra, but could definitely smell it! We were finishing up the game drive, having seen some of the usual game such as giraffes and zebras, and were driving back to the house. 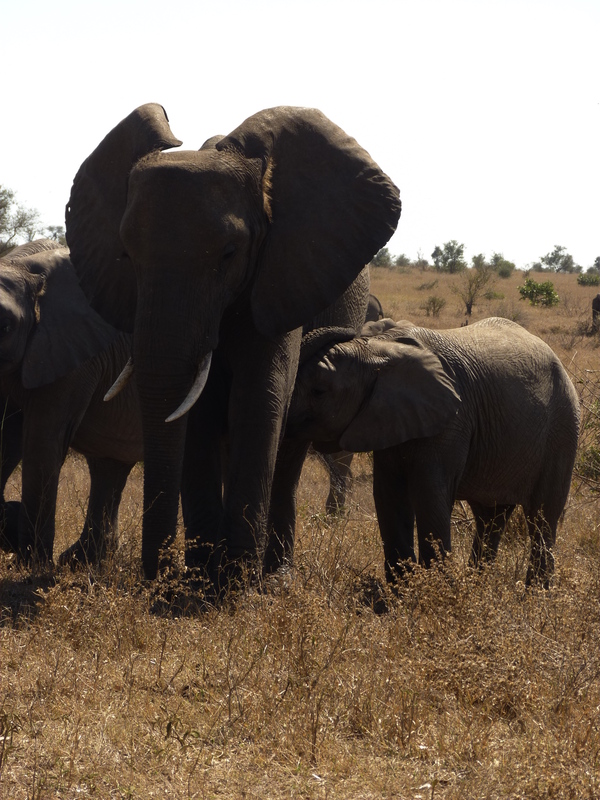 However, not long before reaching it (in fact, just as we were about to turn into the driveway), we heard an almighty crashing noise and realised that there were a bachelor herd of elephants nearby. In the dark. Whilst we were in an open top game drive vehicle. Between us and the house. Nervous doesn’t cover what I was feeling. A couple of the boys ambled out of the darkness towards us, with an unusual surprise. One of them had a rug and another had a foam mattress – stolen goods! The one with the mattress flipped his trunk and tossed the mattress onto the back of his neck. Despite the nervousness and shock, we all ended up giggling away madly. I think it was definitely one of the funniest things I have ever seen. Unfortunately I don’t have any photos as we were using a red spotlight to see, and my camera isn’t suitable for low light settings. Oh well, the memory lives on in my head! They wandered off not long after and we drove back to the house, finding that they had pulled up the water pipe! Thank goodness there are no elephants where I am! I’ll be honest, my photography skills are very amateur. I tend to take photos for memory and for the sake of identification purposes with birds and insects. I don’t really know anything about exposures, aperture or iso. Or even how to edit a photo beyond cropping it. The other research assistant here is the opposite, her photography is amazing. As former Vice-President of a university photography society, I guess that would be kind of obvious. Whilst I like most of the photos I take, her photos just put mine to shame. She knows what all those words mean, and knows how to put them into action to take some truely stunning photographs. She has a Flickr site (http://www.flickr.com/photos/hayleyho/) but is incredibly perfectionist about which images she uploads onto there – so at the time of writing, there are only two from South Africa on there. She has given me permission to use some of her photos for future blog posts, so if there is a particularly spectacular image on here, it is likely to not be mine. Of course, her photos will be credited on here, I’m not going to try and steal her thunder. Maybe I shouldn’t put my photography ability down so much, but truthfully if I take a great photo, it is only partially skill and likely quite a bit of luck! After having just seen four different species that all made me very aware of my own lack of power by being a human (elephant, lion, crocodile, hippo), you might consider the next species to be somewhat uninspiring but I beg to differ. It was a Lilac-crested Roller Bird, and man, I was inspired. If you look at the photo below, I think you can see why. What a beautiful bird, with such colours! Take into account that I’m mesmerized by pretty much all birds, and you can see why I would be even more so enchanted by this species. A quick aside – why am I mesmerized by birds? How could anyone not be? True, there are some very plain-looking ones and ones that can get very annoying (I think of my local park at home and the Canadian geese), but take a moment and think about the birds themselves. They’re very existence is amazing. To wonder how they evolved in such a way to exist in their form, and the adaptations that each species has. Beaks, feathers, wings! Then the differences in the types of beaks between different birds. When I start thinking about things like this, I just get slightly overwhelmed by how truly astonishing nature is. And that’s just thinking about one group of animals – take into account the mammals, the reptiles and such. Then go further and include all the plants, the fungi and a seemingly unending amount of bacteria. That’s not taking in the environment and then all the other science-y bits, the chemistry and the physics that make up our world and beyond. Overwhelmed doesn’t really cover it. Anyway, enough of going along that tangent and let’s return to Kruger and the wonders there. Our next sightings were mostly repeat species – waterbuck, a crocodile, giraffes and an impressive male elephant. But repeats are fine with me. I absolutely love waterbuck. They remind me slightly of the red deer in the UK with their bearing, plus they have those heart-shaped marks on their noses – very endearing. This viewing was also quite exciting as they were at a waterhole with a crocodile. Slightly macabre, but I was half-hoping to see an attack. Not that I wished injury or death on the waterbuck of course, yet it would have been interesting to watch in a behavioural researcher kind of way. 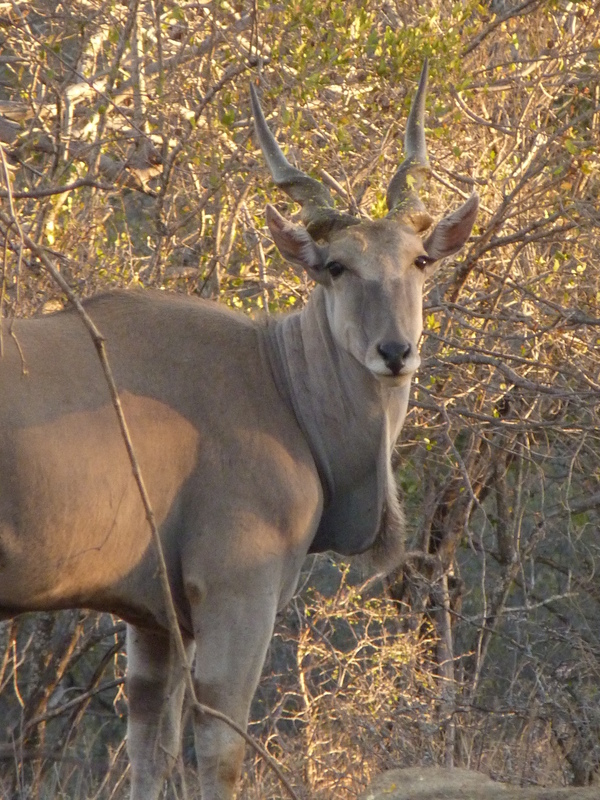 For a while after this, the sightings were much the same – waterbuck and zebras. As mentioned, I love the waterbuck and if you know me even vaguely, you’ll probably know that I am slightly obsessive about zebras (my undergraduate dissertation was on their behaviour). One thing did bring me out of my general excitement and into curious mode – the zebra in the photo below (apologies for the slightly unfocussed quality of the photo). 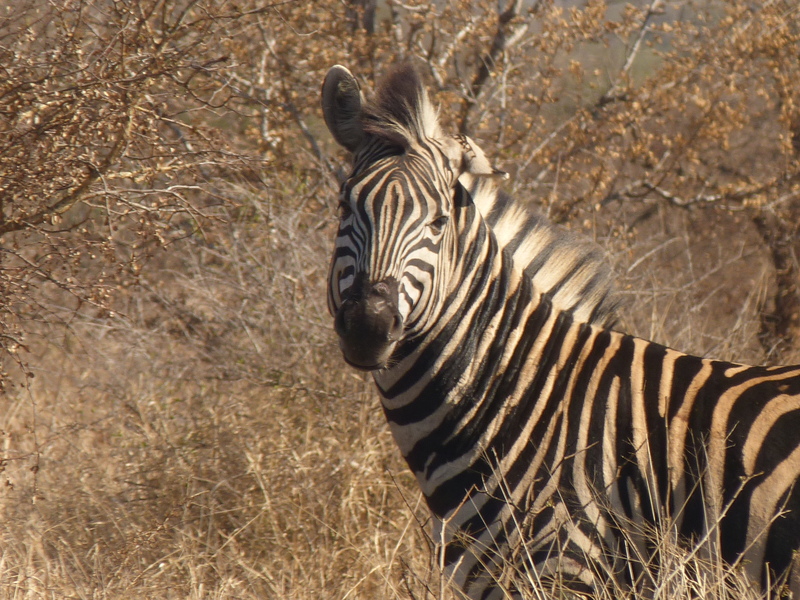 I’ve not yet seen a zebra with an ear like that – seemingly partially folded over. Maybe a birth defect or injury? If you’ve seen it before and it is neither of those, then I admit my mistake but until then I shall wonder. 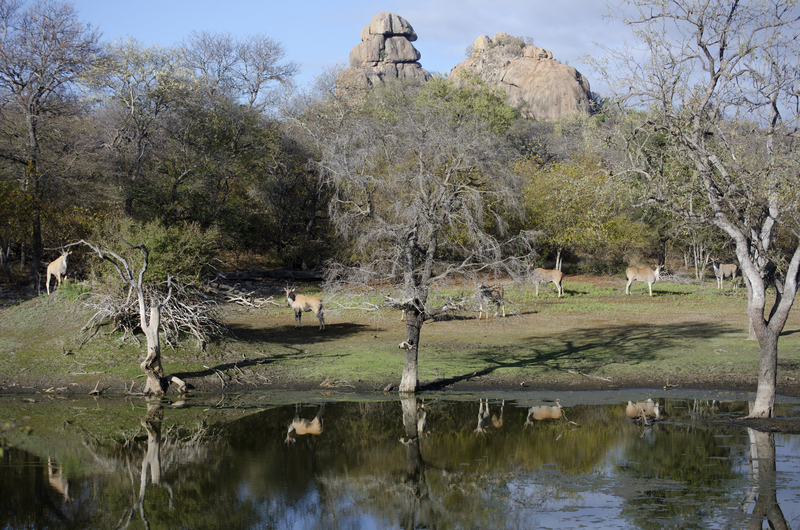 Following an increasing number of zebra and waterbuck sightings, we came across three gorgeous kudu bulls who helpfully provided a scenic photo opportunity. I was hoping that they would walk back towards us and I could catch them all in the same position, but unfortunately not. Such is wildlife. Further sightings: bustard (a bird), zebra (including the adorable youngest below), an unidentified snake on the road, hippos and kudu. Our last Big 5 animal sighting before leaving the park was a very flaked out white rhino. He was so still then we initially worried that he might have been dead. Thankfully he flicked his ear and we gave a sigh of relief. As dusk started to settle in, we headed for the gates, keeping an eager eye out for any last sightings and hoping that we’d see a leopard. 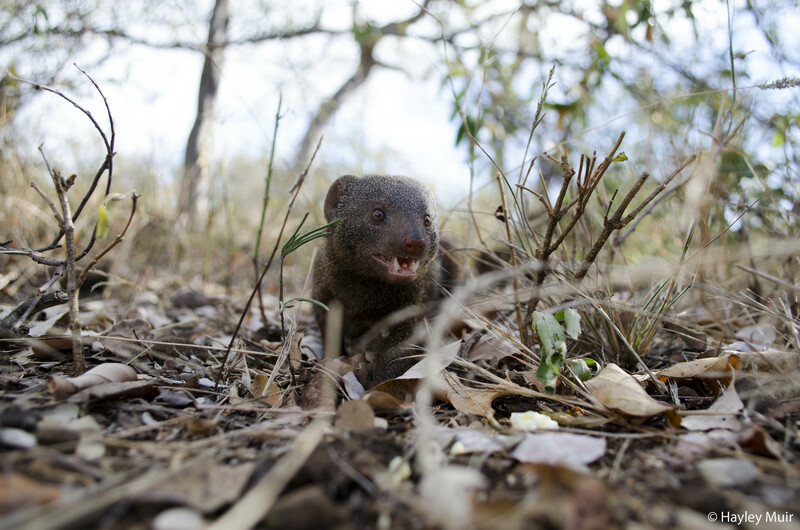 Our luck was out for that, but we did see a dwarf mongoose group as they arrived back at a sleeping refuge. Being slightly obsessed with them, we stopped the car and watched them for a while. Which caused amusement amongst us, as this in turn meant that other cars would stop near us and look for our sighting. Whether they saw the mongoose, I don’t know. If they did, it is likely they were quite puzzled at us stopping for such a small animal. Hopefully, they appreciated them, though I doubt it could be as much as we did. Our last sightings as dusk fell were an ostrich, a steenbok and a vulture (unsure of the species). Driving out of the park, we felt very satisfied with our day, despite not seeing some of the animals we had hoped to see. However, we had come to the park with the full knowledge that wildlife does as it wants. On the drive back I watched the stars come out, appreciating the waning moon and the evening star, before contentedly falling asleep. And that my friends, brings my day out at Kruger to an end. But I should warn you, I went on another game drive later in the week and if the events from that aren’t worthy of a blog post, I don’t know what is! For now, I shall say – prepare yourselves to be jealous. I wanted to add more photos to this post, but the internet is playing up I’m afraid. Hopefully you’ve read Part One and know where I’d got to in describing our sightings in Kruger so far. If not: we were spending our day off in Kruger National Park, sightings so far include: giraffes, kudu, zebras, wildebeest, hippos, crocodiles, jackal, steenbok, a variety of birds (fish eagle, vulture, lilac crested roller, pearl-spotted owlet) and dwarf mongoose. So, onto the next exciting animal that we saw. I’d been flicking through the map and information on Kruger and had been commenting on some of the animals. 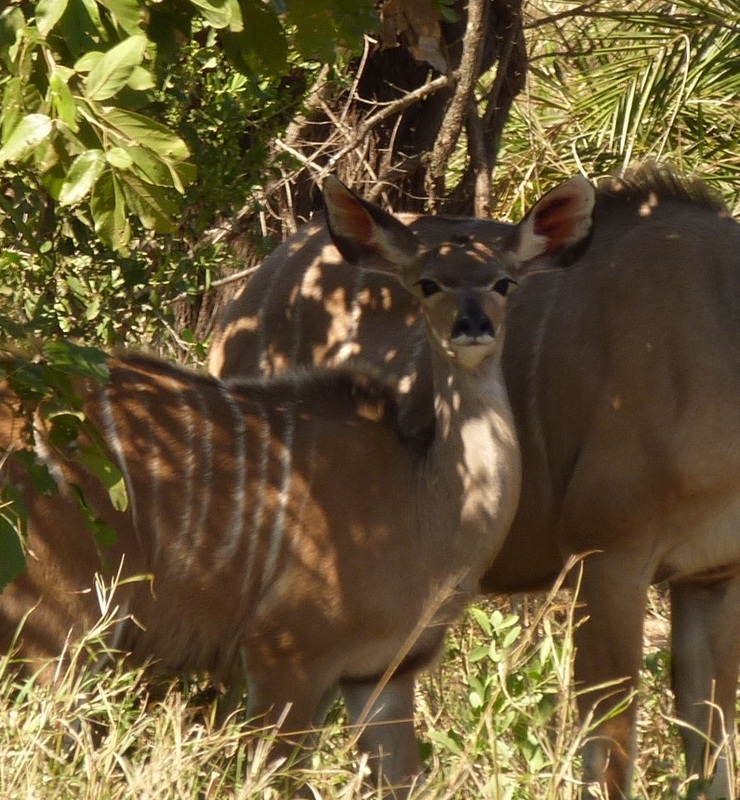 One of which was a baby kudu to which I’d exclaimed “Oh, it’s adorable! How amazing would it be to see one? !” And would you know, we came across a couple of them. One of them was quite close to the road and luckily not hidden by bushes, and we got an amazing view of it suckling. As you can imagine, I was ecstatic. After the kudu headed further into the bush, we moved on, driving past a far off herd of zebras and wildebeest, and then came across our second Big Five animal. The elephant. Or should I say, elephants. Fifteen of them! Ambling across the plain, completely unconcerned by our presence. We decided that the matriarch was the one with a collar, and were aw-ing over the smaller ones when an absolutely tiny one appeared! We were treated to an incredible view of it suckling from the mother. Ecstatic? Now I was thrilled beyond words. I’ve seen elephants before, but only in UK zoos and this was a very different experience. There is nothing quite like having a fully-grown elephant near you and realising that you are actually a very fragile animal. I can’t imagine what it must like if it were an angry elephant, or what it is like if you were to be on foot. We spent almost an hour with the herd, and were amazed by other vehicles who either stopped very briefly or just drove straight on. Perhaps they knew of a special sighting further ahead or were limited by time. But we were having the time of our lives just sitting our car watching the herd grazing and watching their interactions. It must be incredible to be an elephant researcher and spend all your time with them. Eventually the herd moved off into some trees and out of sight, and we carried on. After some further sightings (giraffe, oxpeckers, wildebeest, monkeys, impala), we came across our third Big Five animal. Two male lions sprawled in shade on the edge of the road. Again there was the sense of power from them and feeling rather fragile in comparison, especially when you look at the size of their paws! But I still enjoy a day off, whether it is chilled day with the rare occasion of using internet properly or celebrating Christmas in the bush. However I think that the most recent day off definitely tops the list as we drove an hour or so, having got up ridiculously early and left the house at 5am, and went on a day trip to Kruger National Park. Luckily we aren’t too far away and we are just over an hour’s drive from the one of the main entrances (Orpen Gate). Before we even got there I was marvelling over something, this was the second time that I’d got up before sunrise here and it was still fully dark with an amazing view of the stars. I even saw Orion, which I didn’t realise could be seen from the southern hemisphere (showing my lack of knowledge of stars!). I would’ve taken a photo, but my camera isn’t suitable for that (or I just haven’t worked out how to do it). Kruger itself was just fantastic. Our first sighting was a group of giraffes not long after sunset which provided a very atmospheric photo opportunity. I find giraffes so interesting, and having worked with them, watched a post-mortem of one and written university essays on them, I have found that my regard for them has just increased each time. But I shall save my praise for another time. Not long afterwards we came across a stunning kudu bull who we estimated to be roughly 6 years of age (due to the number of twists in his horns, but none of us know much about kudus so we may be wrong). Our first good bird sighting was a Pearl-Spotted Owlet (Glaucidium perlatum) perched in bush not far from the road, presumably on the lookout for a small mammal or bird.Our first of the ‘Big Five’ was a duggar African Buffalo bull. 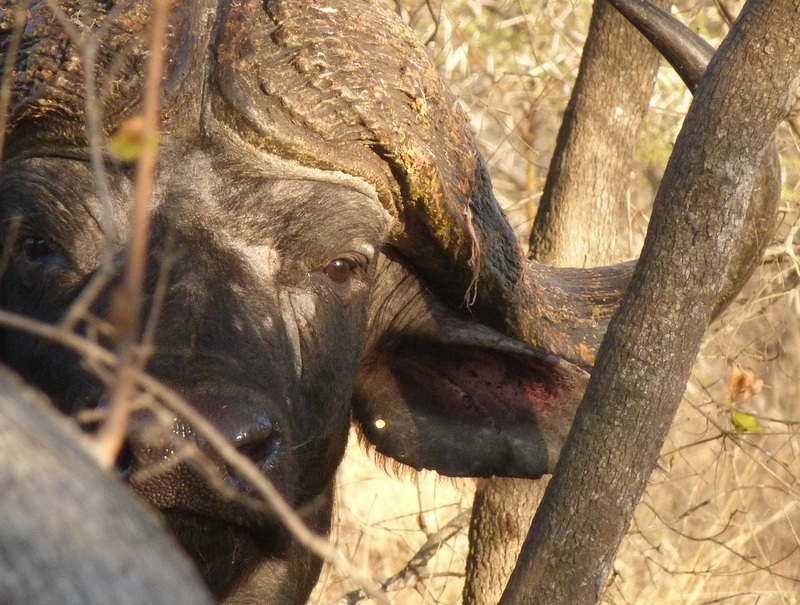 A dagger bull is an old solitary male who is past breeding age and has left the herd. Our fifth sighting caused much excitement amongst us. Can you guess what it might have been? No doubt you’re thinking something big or rare – elephants, leopards, lions, cheetahs, rhinos? I’m afraid not, it was in fact a group of dwarf mongoose! Yup, we were getting excited at spotting the animal we work with day in and day out. I would say that could be conceived as slightly sad, but to me, I think it just shows how awesome dwarf mongoose are. It was at 8am in the morning, quite an early time to be spotting them during the winter but perhaps they were keen to get foraging before the heat of the day set in. 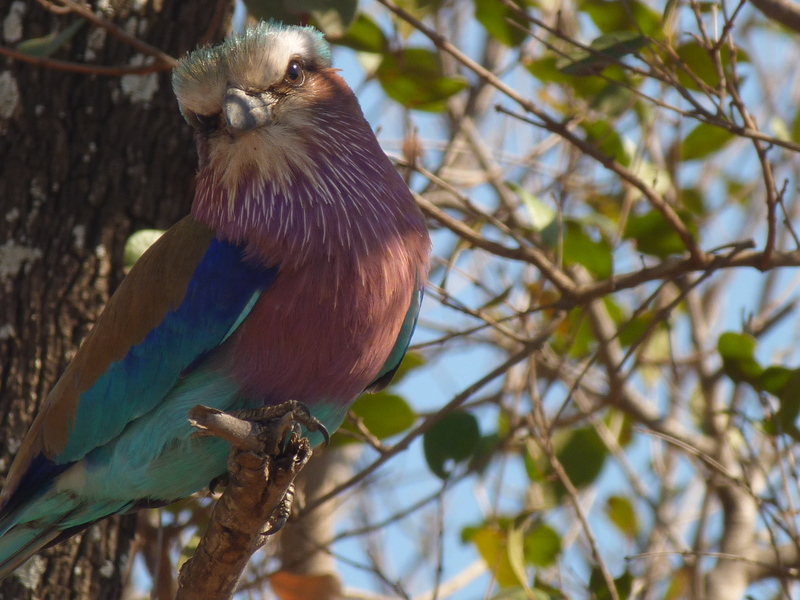 Further sightings that I shan’t go into too much detail about were: steenbok, waterbuck, black-backed jackal, vulture (possibly a White-backed), baboons and lilac-crested roller bird. We came to our first dam, where a fish eagle circled overhead two of the animals I’d been longing to see. In the water, with just the tops of their heads visible, were a number of hippos. We have been hearing them in the river outside our house and they apparently graze on the lawn in the early morning, though I’ve not seen them yet. So I have been hoping to see one, and here were a whole group of them! 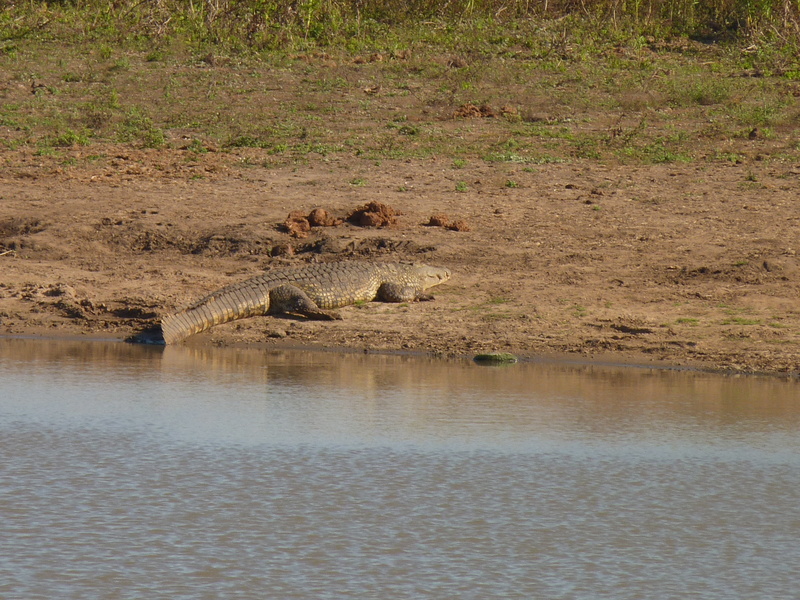 In addition, there was a large crocodile lying on the bank and relaxing in the morning sun. I think I caught of glimpse of one at the reserve where we work, but it was quite a brief viewing. I was very impressed by this one and a discussion about their death rolls and larders quickly reinforced my opinion of the species. 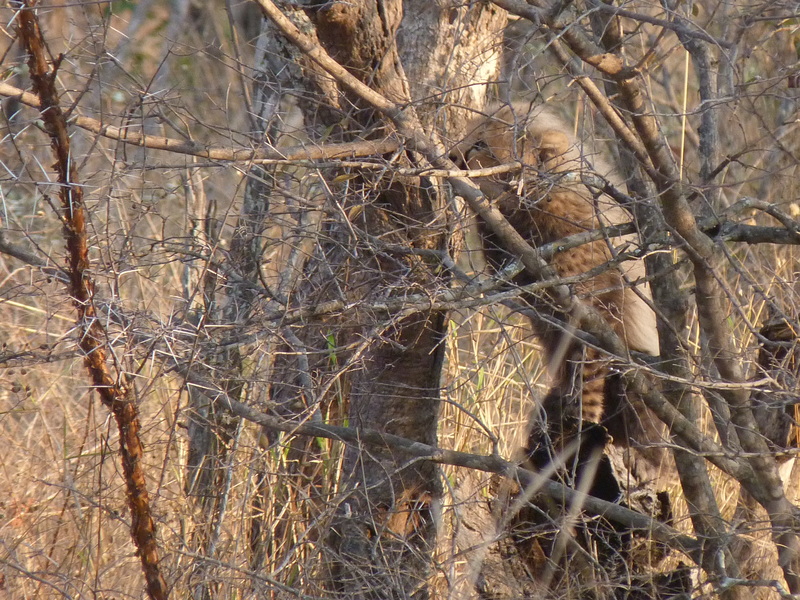 Further sightings for part one: another Pearl-Spotted Owlet, a second group of dwarf mongoose (yippee! ), wildebeest, giraffes and zebras (if you know me, you’re probably surprised that I am not writing a long essay about zebras, but don’t worry I’m just saving it up for another time). I shall wrap up this post and tease you with a couple of details from part two – a suckling youngster, and close encounters with a Big Five animal.